Table ideas: 1. 2. 3. I feel like I'm being pessimistic when I say that we are only about 65% finished with our loft remodel. Sure, the permanent wall and bedroom door are up, the floor has been refinished, the concrete sealed and most of the painting has been done but we still have to do the following majorly BIG jobs: Install wallpaper (planned for this Friday). Purchase and install new hallway, bedroom, and dining room lights. Install 3-form movable wall (!!). Order and install custom hallway closet + bench. Re-tile bathroom (!!!). Paint bathroom. Install new shower lights. Install new bathroom mirror. And then redecorate just a little. Okay. Maybe we're more like only 55% finished with this project. What I am really excited for, though, is the redecorating. Luckily we have an expert helping us as I feel like I'm a little all over the place when I try to decorate a room by myself. We are in the market for a few things like a new couch and more FLOR carpet tiles for our living room but until a certain two black cats are no longer alive or living here in our loft, we will be keeping our old couch and bare floors as they are a scratching and oftentimes puking nightmare. What we really need is a dining room table! Since we don't currently have one, on most nights, Lee and I eat dinner on the couch in front of the TV after Alice has gone to sleep. And I'd like to change that! Family dinners are a major priority for me in the upcoming year but, without a table, that's a difficult priority to implement. So help me pick a table! 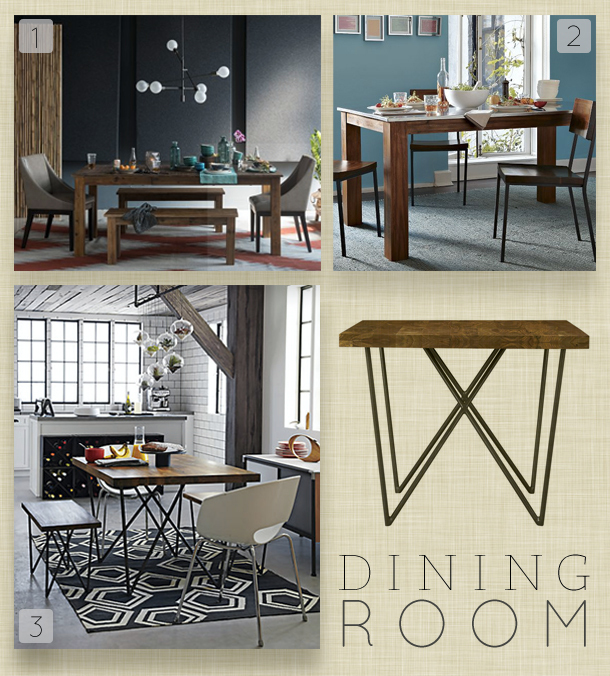 Since our dining room is small, I'm leaning towards the design of number 3 as the thin metal legs hopefully won't overwhelm the space. But, just my luck, that table doesn't come in the size we need so we might have one custom-made instead. And we've decided to go with a bench for one side of the table for when we have company and then a few stack-able chairs (like these ones!) for us adults. What do you think? Do you sit down to eat dinner as a family? I was going to say #3 too! I'm bummed that it doesn't come in the size you need. I will keep my eyes out for anything similar! And YES we eat at our table every evening as a family, though it didn't happen when our boys were younger! Number 3 is my favourite. A custom made one will be worth it, especially when you are short of space. I've made a point of us eating all meals (breakfast included) at the dining table, which is just off the kitchen. I think the table makes for better conversation. We do have a pizza exception of course, pizza must be eaten in front of a tv! Bri, my brother and his friend have been making tables just like the designs you're looking at. They use mostly reclaimed wood and they have recently done a few table with the metal hairpin legs similar to #3 in your picture. They have done a bunch of local, residential projects (working with interior designers or word of mouth) but they also did the tables & barstools in Bodega and the new tables in Ruth's Chris in Park City. I'll see if I can get some pictures to email you if you're interested.